This craft set is ideal for the embroidery novice who is eager to grow their skills. Whether or not you have a stitch of experience with embroidery, Megan Eckman's easy-to-follow kits allow you to swiftly create a threaded work of art. 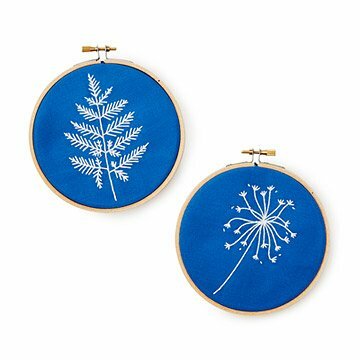 The botanical patterns are based on the cyanotypes of 19th-century botanist and photographer Anna Atkins. Each kit uses just two types of stitches, making this craft set ideal for the embroidery novice who is eager to grow their skills. Assembled in Vancouver, Washington. A few years ago, Megan was in a crafting funk so she went to a craft store, hoping to find something fun to embroider. What she found instead was the exact same patterns she had stitched with her grandmother when she was little. Much as Megan loved them when she was seven, there was no way she was going to sew any of those Day of the Week patterns again. So Megan decided to make her own. Megan graduated from art school a year earlier so it was easy for her to turn her drawings into the first patterns she stitched. Soon enough, she had people asking if she could make kits so they could sew them too. Megan quickly realized then that lots of people were in their own creative funks and were in need of something fun to stitch. That is when Megan began planning out how to make the best kits she could and that was the start to her company. By designing kits that are fun instead of frustrating, Megan gives people the chance to relax while having some creative play time. Kit includes: instructions, wooden hoop, embroidery thread, needle and fabric. These little needlepoint kits were a quick, fun and modern way to revisit the needlepoint skills I learned as a child with the matriarchs of my family. I enjoy needlepoint, but I like more modern designs, not the traditional, Thomas Kincaid style. The designs are clean and simple, and you can use simple techniques to stitch, or go for more advanced if you prefer. I like being able to appreciate the designers art and still make it mine.